L-tyrosine and L-dopa are two substances that differ slightly in their chemical structure and biological function but are linked by the processes your body uses to convert one substance into another to meet its needs. Both L-tyrosine and L-dopa help to produce the chemicals you need for low-level nerve and muscle function as well as your sensory, emotional and psychological well-being. There are dietary supplements available that contain L-tyrosine, and you can find supplements containing an herbal extract rich with L-dopa. Talk with your physician before you take L-tyrosine or L-dopa to treat a medical condition. Tyrosine is an amino acid your body uses to build proteins and neurotransmitters. Tyrosine is classified as a nonessential amino acid because your body usually can make all it needs from the amino acid phenylalanine. If you have the genetic disorder phenylketonuria, your body cannot make tyrosine. You need to eat foods rich in tyrosine or take supplements. You can get tyrosine from soy-based foods, poultry, fish, peanuts, almonds, avocados, bananas, dairy products, lima beans, pumpkin seeds and sesame seeds. L-dopa -- also known as levodopa -- is a chemical your body uses to make the neurotransmitter dopamine. Neurotransmitters are chemicals that help your nervous system transmit information between nerve cells. Your body makes L-dopa itself from the amino acid L-tyrosine. You can supplement your body's supply of L-dopa directly by taking dietary supplements or by eating fava beans and Mucuna pruriens, also known as velvet beans. L-dopa is also in prescription-only drugs sold under the names Sinemet, Parcopa, Atamet, Prolopa, Stalevo and Dopar. L-tyrosine's biological activity is apparent indirectly through the proteins and other chemicals your body makes with it. In addition to L-dopa, tyrosine is converted to the neurotransmitter and stress hormones epinephrine and nor-epinephrine. Your body depends upon adequate amounts of L-tyrosine to help you cope with the physical aspects of stress or sleep deprivation by producing enough epinephrine and nor-epinephrine to meet its needs. The Naval Aerospace Medical Research Laboratory conducted a study of the nighttime cognitive and motor skill effects of L-tyrosine on sleep-deprived subjects. In the study published in the journal "Aviation, Space, and Environmental Medicine" in 1995, researchers found that L-tyrosine was more effective than a placebo in improving the subjects' ability to perform certain tasks for 13 straight hours – despite being kept awake during the day of the test. High doses of L-tyrosine may cause nausea, diarrhea, headaches, vomiting or insomnia. In additon, taking L-tyrosine with monoamine oxidase inhibitor antidepressants can cause a dangerous rise in blood pressure. If you are taking the antidepressants isocarboxazid, phenelzine, tranylcypromine or selegiline, you should avoid L-tyrosine dietary supplements and reduce the amount of tyrosine you get from your meals. L-dopa's biological activity comes through its conversion to dopamine, which is important to your ability to precisely control your muscles. The lack of dopamine in certain parts of your brain can cause Parkinson's disease. Parkinson's is treated using L-dopa rather than dopamine itself because dopamine cannot cross the blood brain barrier. L-dopa does reach the brain, where it is converted into dopamine. Prescription L-dopa products contain the chemical carbidopa, which keeps the L-dopa dose from being converted to dopamine by enzymes outside the brain. Side effects of L-dopa can include irregular heartbeat, low blood pressure, nausea, confusion, anxiety, vivid dreams, hallucinations, drowsiness, inability to control your muscles, speech problems, muscle spasms and slow-motion movement. 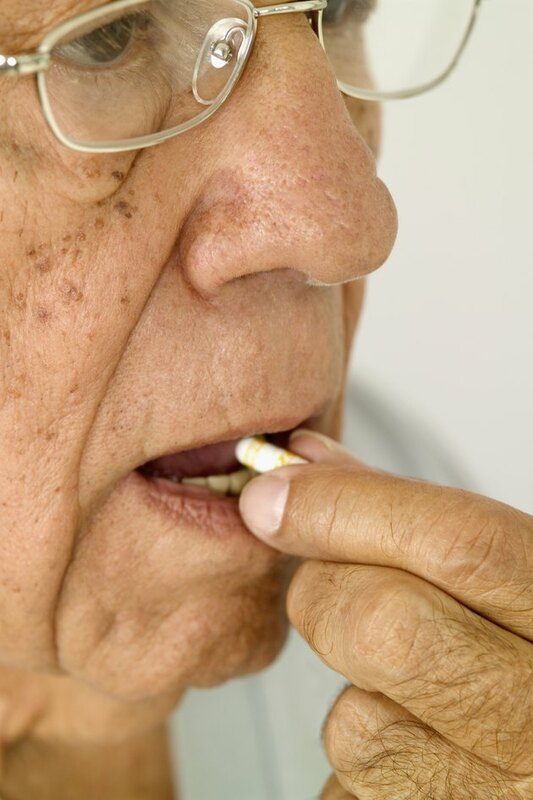 Patients taking L-dopa for Parkinson's may experience diminished effect or tolerance over time, The physician then must balance the need to increase the L-dopa dose enough to stop Parkinson's symptoms, yet avoid the inevitable dopamine side effects.